... or at least 86 evangelical Christian leaders are. The New York Times reports that 86 evangelical Christian leaders have decided to back a major initiative to fight global warming, saying "millions of people could die in this century because of climate change, most of them our poorest global neighbors." 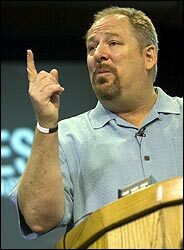 Among signers of the statement, which was released in Washington on Wednesday, are the presidents of 39 evangelical colleges, leaders of aid groups and churches, like the Salvation Army, and pastors of megachurches, including Rick Warren (pictured above), author of the best seller "The Purpose-Driven Life," according to the Times. "For most of us, until recently this has not been treated as a pressing issue or major priority," the statement said. "Indeed, many of us have required considerable convincing before becoming persuaded that climate change is a real problem and that it ought to matter to us as Christians. But now we have seen and heard enough." The statement calls for federal legislation that would require reductions in carbon dioxide emissions through "cost-effective, market-based mechanisms" — a phrase lifted from a Senate resolution last year and one that could appeal to evangelicals, who tend to be pro-business. The statement, to be announced in Washington, is only the first stage of an "Evangelical Climate Initiative" including television and radio spots in states with influential legislators, informational campaigns in churches, and educational events at Christian colleges. "We have not paid as much attention to climate change as we should, and that's why I'm willing to step up," said Duane Litfin, president of Wheaton College, an influential evangelical institution in Illinois. "The evangelical community is quite capable of having some blind spots, and my take is this has fallen into that category." According to the Times, several influential evangelical leader's opposed the statement and tried to derail any action on the Climate Initiative. Twenty-two of them apparently signed a letter in January declaring, "Global warming is not a consensus issue." The letter was sent to the National Association of Evangelicals, an umbrella group of churches and ministries, which last year had started to move in the direction of taking a stand on global warming, and asked the the association not to issue any statement on global warming or to allow its officers or staff members to take a position. "It's a very centrist evangelical list, and that was intentional. When people look at the names, they're going to say, this is a real solid group here. These leaders are not flighty, going after the latest cause. And they know they're probably going to take a little flak." The list of intiative supporters also includes several prominent black leaders including Bishop Charles E. Blake Sr. of the West Angeles Church of God in Christ in Los Angeles, the Rev. Floyd Flake of the Greater Allen A.M.E. Cathedral in New York City, and Bishop Wellington Boone of the Father's House and Wellington Boone Ministries in Norcross, Ga.; as well as Hispanic leaders like the Rev. Jesse Miranda, president of AMEN in Costa Mesa, Calif, according to the Times. The evangelical leaders are meeting Wednesday with senators or their staff members concerned with legislation on energy and the environment. Their letter commends senators who last year passed a resolution by Senators Pete V. Domenici, a Republican, and Jeff Bingaman, a Democrat, both of New Mexico, which called for regulatory measures like a cap and trade program, a system in which industries would buy or trade permits to emit greenhouse gases. In their statement, the evangelicals praised companies like BP, Shell, General Electric, Cinergy, Duke Energy and DuPont that it said "have moved ahead of the pace of government action through innovative measures" to reduce emissions. The television spot links images of drought, starvation and Hurricane Katrina to global warming. In it, the Rev. Joel Hunter, pastor of a megachurch in Longwood, Fla., says: "As Christians, our faith in Jesus Christ compels us to love our neighbors and to be stewards of God's creation. The good news is that with God's help, we can stop global warming, for our kids, our world and for the Lord." The advertisements are to be shown in Arkansas, Florida, Kansas, New Mexico, North Carolina, South Carolina, South Dakota, Tennessee and Virginia. These are very influential people whose opinions sway those of thousands of normal Americans. To have them throw their support behind climate change mitigation may go along way towards shifting the mindset of Joe and Jane Average towards believing that climate change is a real issue that deserves attention from thair political leaders. After all, it's getting attention from their spiritual leaders.